Overview: Don't just pocket a win. 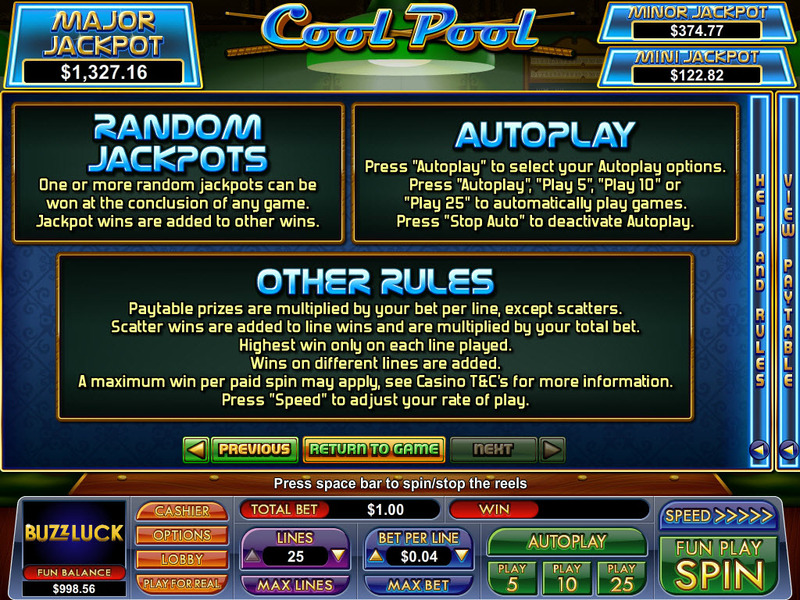 Corner-pocket it in Cool Pool, a 25-payline online slots game that that's way cooler, way more rewarding than any trip to your local bar. Grab a pool cue, rack up the balls, and show the other guys what you're made of. 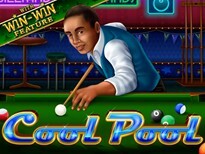 There are loads of opportunities to become king of the billiard bar without having to be a pool shark. 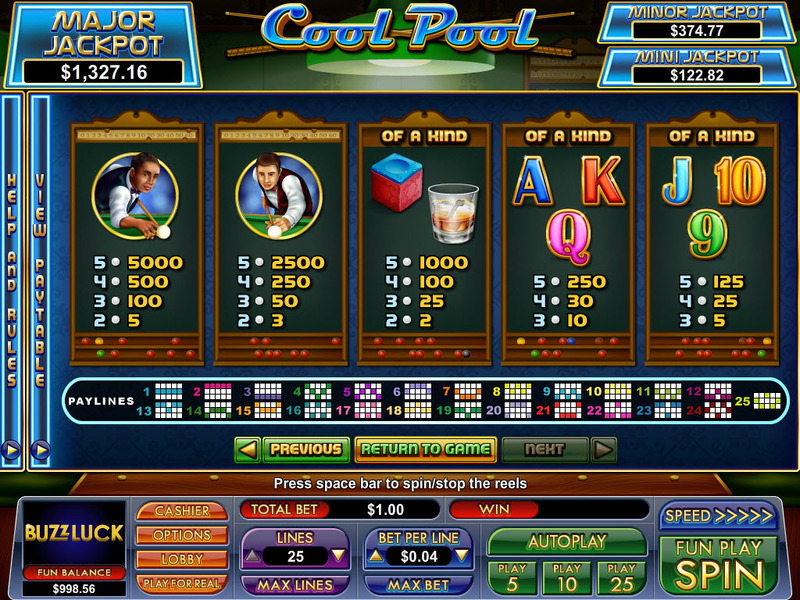 This 5-reel game features three big jackpots, including a Major one that resets at $1,000, a Minor one with a $250 reset amount, and a Mini one that resets at $50. And don't worry about accidentally scratching and giving the other guy a win every now and then. 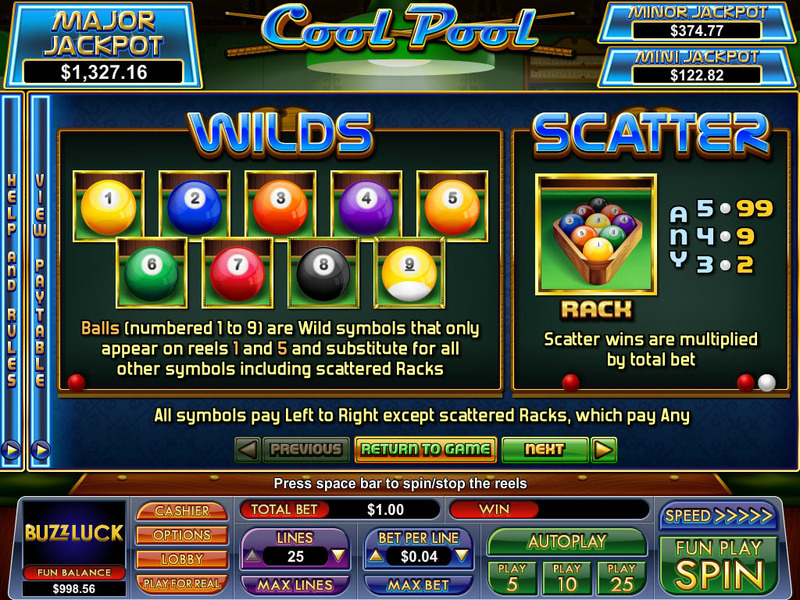 Cool Pool also features a top award of 45,000x your bet per line and nine separate wild symbols to make winning easier than ever. 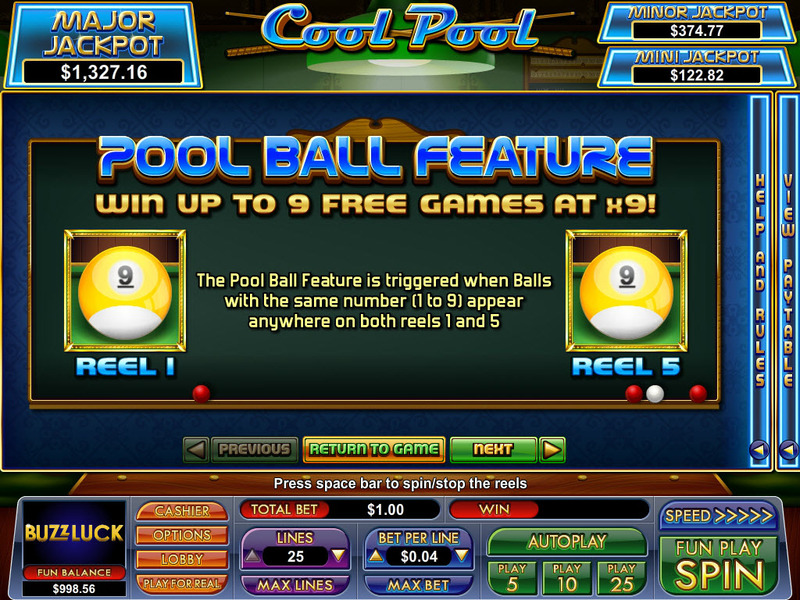 Land on two balls with the same number on reels 1 and 5, and you'll get to play the Pool Ball Feature game. 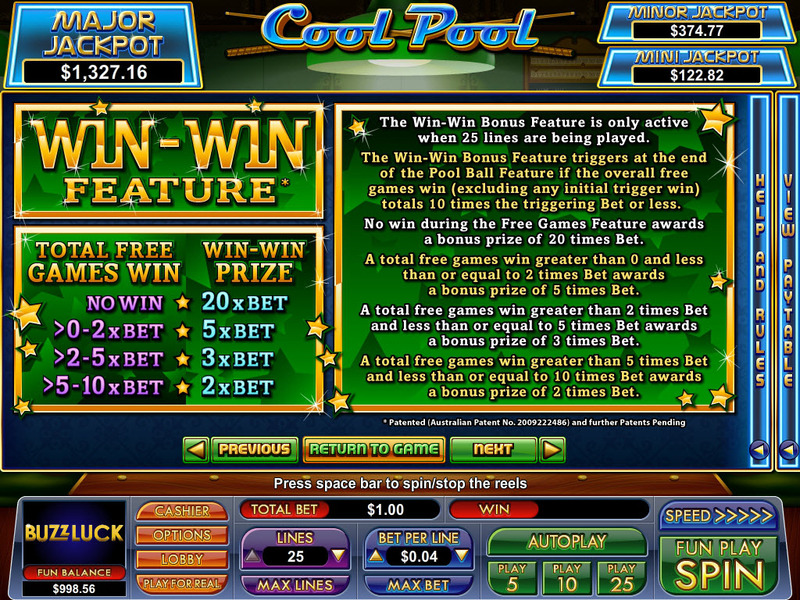 Whatever number you landed on becomes the free games prize multiplier and the number of games you'll get to play, so your winning potential is even more impressive. You wouldn't play pool with one ball missing from the triangle. So why play Cool Pool with anything less than 25 lines? Playing every single one is your ticket to activating the Win-Win Bonus Feature. 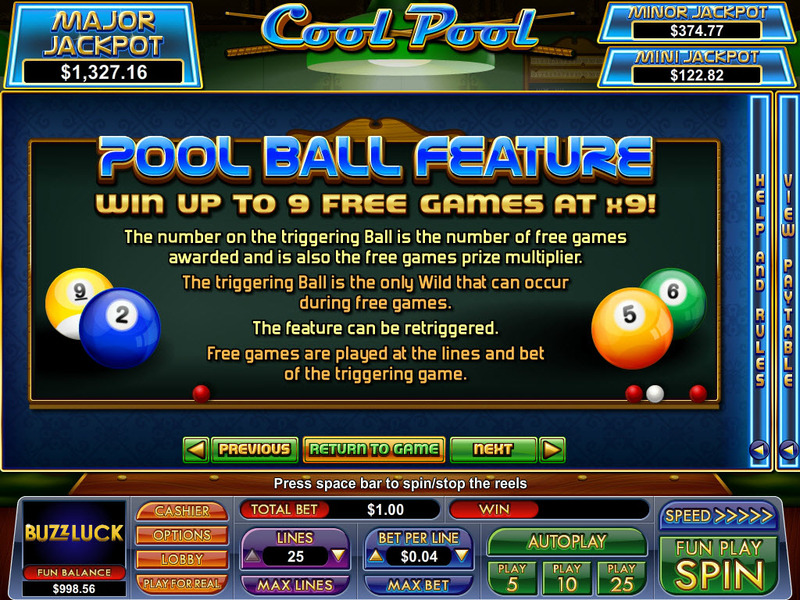 If you end up with no wins during free games, you'll earn a bonus prize of 20x your bet, so you don't have to worry about accidentally smacking that 8-ball into the corner pocket. 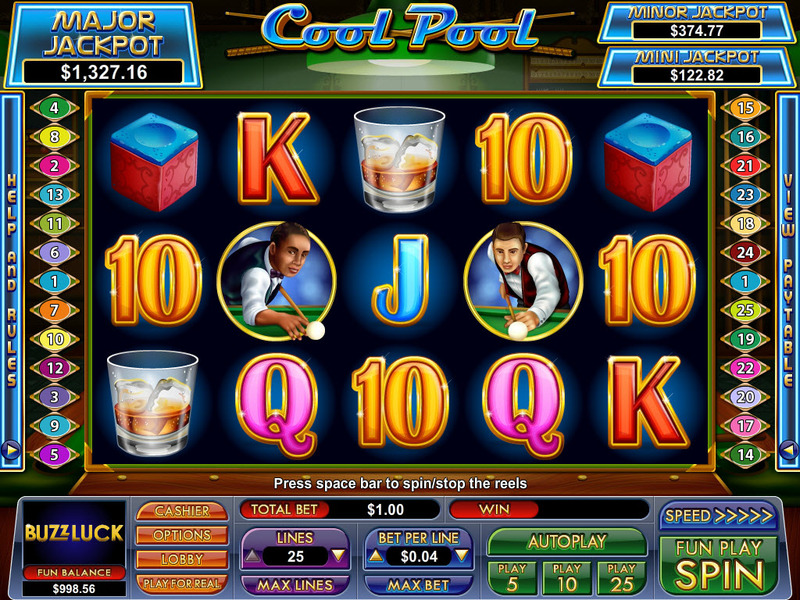 Similar Slots: If you like Cool Pool, you might like these other slot machines from NuWorks: Batter Up, Fire, Wind and Water, Head Hunter, Judo Ferret, The Champ.